Listing available webcams, identifying supported resolutions, viewing live video and grabbing frames should all be pretty straightforward things, right? Well, it turns out that, even in 2017, they are a little more tricky than one might expect. This article will help you do all those things while avoiding the gotchas that pave the way to webcam control. As you may know, the legacy navigator.getUserMedia() approach has been deprecated and is no longer a web standard. Therefore, we will be using the brand new, hopefully future-proof, MediaDevices approach. The Media Capture and Streams API offers a modern, promise-driven, getUserMedia() method that is fully supported in Chrome (53+), Firefox (38+) and Edge. While this API is not yet supported by all browsers, it is definitely the way of the future. If you need to support other browsers, you should take a look at adapter.js. If you develop physical computing projects with NW.js or Electron, you are all set to go! This means you need to serve your webcam-enabled web pages over the HTTPS protocol. This can be pretty annoying if you do not currently have an SSL-protected website but is very unlikely to change. Other APIs that interact with hardware (such as WebUSB) are starting to do the same. An easy way to get HTTPS hosting for testing purposes is to use GitHub Pages. Obviously, you do not need to worry about that when developing desktop applications with NW.js or Electron. Also, this warning does not show up when working locally or when launching the Chromium environment with the --disable-web-security switch enabled. Before we begin, you may want to take a look at the end result. It’s nothing fancy but it should work in all browsers that support the Media Capture and Streams API. You can also download the code from the GitHub repository. All the code will be added to the script.js file linked at the end of the <body> tag. Here we go! Again, if you are using NW.js or Electron, you do not need to worry about this. If you want to simulate problems with users blocking access, you can click this icon to revoke the permission. As you can see, this function returns a Promise. Like most newer web APIs, the MediaDevices API uses promises instead of callbacks. If you are not yet familiar with them, you really should get to know them because they are not going away any time soon. The promise that is returned by enumerateDevices() is fulfilled with an array of devices. We filter this array and fulfill our own promise with the filtered array containing only video input devices. As you can see, we received an array of MediaDeviceInfo objects that contain two very important pieces of information. The first piece, the label property, provides information about the webcam model (this would have been empty had we not forced the user to authorize access). The second piece is the deviceId. We will need that if we want to connect to a specific device instead of letting the browser use the first one it finds. All we do is retrieve the label and deviceId and use them to populate the dropdown. As a safety precaution, we fall back to using the deviceId for the option’s text should the label be empty (as discussed earlier). This time, instead of simply logging the webcams array, we pass it to the populateDropDownMenu() function. At this stage, you should see your webcam(s) appear in the dropdown menu. The first thing the code above does is retrieve the <video> tag (we will need it later). Then, we grab the device id of the currently selected item in the dropdown. This id is then used to build a MediaStreamConstraints object. In our case, the only constraint is that the device match the id. On Chrome, some conditions currently seem to be flaky. For example, to define the constraints for width and height, you can use either a Number or a ConstraintLong object. This object has 4 properties: min, max, exact and ideal. When I tried to use the ideal condition combined with the min condition, I would always get the min size even though the camera supported the larger ideal size. The point here is: this API is still under development! This constraints object is passed to the getUserMedia() function. If the request is successful, we get a stream which we then assign to the srcObject property of the videoElement. This is the step that actually makes the feed viewable. At this stage, you should see the live feed from your camera. If you have more than one webcams, you should also be able to switch between them. As far as I know, there is no explicit method to disconnect a feed from a <video> element. The solution below has proven effective for me. If you know of a better approach, drop me a line. // Fetch video element. If it does not have a stream, we are done. // Pause the video, stop all tracks and make sure no reference remain. The main difference with the legacy Navigator.getUserMedia() approach is that you must call the stop() method on each track instead of calling it on the video element itself. A cool thing to do with a live webcam feed is grabbing frames for further processing. 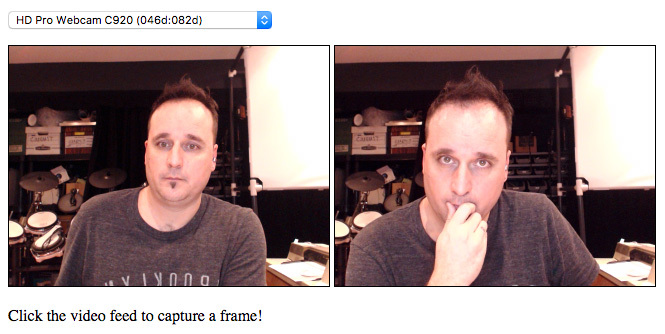 Grabbing a frame basically means drawing one image of the video feed into an empty <canvas> element. Once the image has been drawn on the canvas, there are tons of things that can be done with it such as applying effects. // not have the same aspect ratio as the target canvas. // Draw the snapshot/image onto the canvas. As you can see above, we need to grab references to a few things: the video element playing the webcam feed, the canvas where the image will be drawn and a 2D drawing context which we will use to draw inside the canvas. Those thing are enough to do the drawing. However, since the webcam’s width to height ratio might be different than that of the canvas, we do a bit of math so that we use the full width and resize the height according to the ratio of the source. With that done, we use the drawImage() method of the context to perform the actual drawing. This function has many parameters which you can look at in details by viewing the object’s documentation. At this stage, you should be able to grab frames at will. This translates the matrix off to the right and then flips it back into place. There you have it. I hope this has proven useful. As always, you are welcome to comment below to further the discussion. 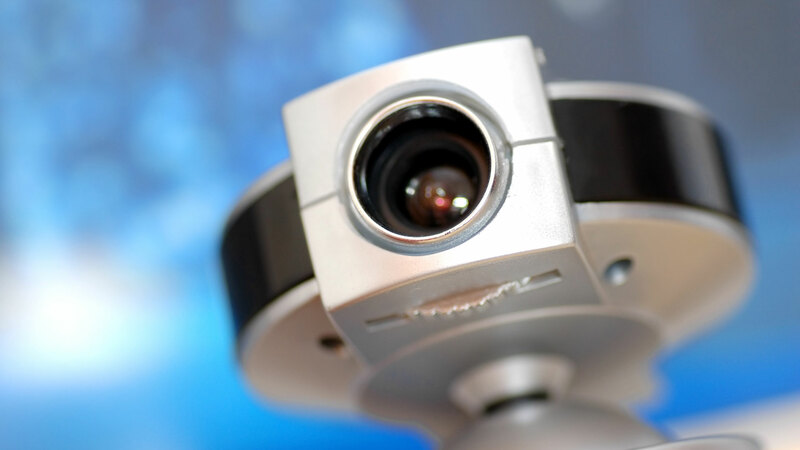 The header image of the webcam was designed by Freepik and is used in accordance with their licensing terms. Nice and tidy, thanks much. I am making this into an Electron app for my wife’s animation projects. I would like to add a feature so that she can choose a directory, and with every click the image is saved and enumerated in that directory. This will then be wired up to her foot-operated mouse. You should be able to do all that with Node.js’ File System API. Hey there a more efficient way to grab the image frames from the webcam without having the copy from the canvas? I don’t think there is another way but I’d love to hear it if it exists! !